It is once again time for the University of Kentucky to celebrate the work of our student scholars. We gather to recognize their achievements, and to award them their degree during our 146th Commencement Ceremonies. Over the last two years, I have interacted with our ambitious students – tomorrow’s leaders who, in profound ways, are leading today. Students are engaged in our laboratories and research centers; they lead student organizations and serve our community; they excel in our classrooms, perform in our recital halls, and learn in our libraries; and they set good examples as members of the UK family. The activities that happen across our institution every day are incredible and inspiring. They teach us valuable lessons and they honor the Promise – a Kentucky Promise that binds us to this place and to each other. In the week leading up to Commencement, University of Kentucky Public Relations has written a series on our students and their experiences while on our campus. If you haven’t had an opportunity to enjoy these touching stories, please take a moment to read about Josh Nadzam’s work to empower at-risk students in pursuit of a higher education; some of our national championship student-athletes; outstanding student artists like Reggie Smith; a first generation college graduate; or enjoy the story of Julia Meador, a recent UK graduate who was forever changed by her experience. Julia now lives in Atlanta, Ga. and works as a strategic communications planning manager at the American Cancer Society, Inc.
As a junior in high school I wasn't even considering attending the University of Kentucky. I thought it was too big, and I was terrified of being just a number. I also grew up a Louisville fan, but please don't hold it against me. However, when my best friend asked me to go with her on her visit to UK I agreed for the simple fact that I could skip class and be on a real college campus. From the moment we got on campus it felt different and special somehow – it wasn’t what I expected at all. The flowers were in full bloom, the students looked so happy to be there, the opportunities seemed endless, and it had an unexplainable air of home. After participating in what former UK President Dr. Todd used to call the "million dollar walk," I was sold and ready to sign on the dotted line. 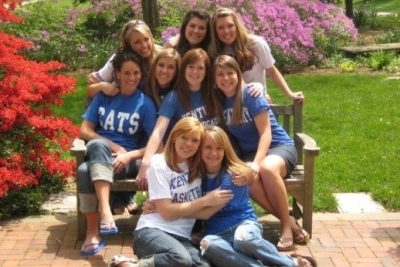 That day, I started a love affair with the University of Kentucky that will never end. Any nerves I had about college life melted away once I was on campus and it quickly became clear that I could be so much more than a number or a face. Getting involved made a campus of 30,000 feel much closer to a campus of 300 with 30,000 things to do and opportunities to relish in. I think UK students everywhere understand completely when I say I am the person I am today because of the University of Kentucky – the amazing people I met, the classes I took, the organizations I was involved with, the experiences I shared, and the opportunities I was provided. The UK community has carried me through the ups and downs of post-graduate life and is one that no matter how far away you are from Lexington, it can still be felt everywhere. I still wear UK blue on every game day, proudly display multiple UK posters in my office, and recruit co-workers’ children and students in my city. To graduates, I say congratulations and savor every minute! But, know that no matter where you go, the University of Kentucky is in your blood and in your soul, and you have an inseparable bond with the best fans and best people no matter how far away from home you are. In stories known and unknown, our students have been forever changed by their UK experience, and they have changed our university for the better. To the graduating class, I extend my sincerest thanks for all that you have given to the pursuit of our Kentucky Promise. With the education you have been provided and the passion and talent you possess, you make true our timeless covenant. You open the door to a bright future for your families, for your Commonwealth and for a world so much in need of all that you are and all that you will be. Thank you … and remember to always “see blue.” forever.